Since 2007, the AKP-led government of Turkey has been signalling its impatience with joining the European Union and attraction to the Russian-and-Chinese led Shanghai Cooperation Organisation, something I documented and commented on three months ago at "Is Turkey Leaving the West?" Though this new liaison has so far had no practical consequences, that could change; thus this weblog entry to follow up on the topic. June 23, 2013 update: The Turkish government is, reports Defense News, "strongly leaning toward adopting a Chinese long-range anti-missile and air defense system, ... even though it may be impossible to integrate the system with its existing NATO architecture." All that remains is final approval from the defense and prime ministers. Sep. 24, 2013 update: Despite its new status as an SCO "dialogue partner," Ankara was not invited to the organization's recent summit in Bishkek. Analysts offer two main reasons for the snub: (1) Turkey is a Western stalking horse. (2) It has the wrong policy on Syria. Sep. 27, 2013 update: Not only did the Turkish government chose the China Precision Machinery Import and Export Corp. (CPMIEC) over rival Russian, U.S. and European firms to co-produce a $4 billion long-range air and missile defence system, the FD-2000, but it chose a company under U.S. sanctions since February for violations of the Iran, North Korea and Syria Nonproliferation Act. Oct. 3, 2013 update: For an analysis behind this decision to buy Chinese and its implications, see "Controversy Deepens Over Chinese Air Defenses For Turkey" by Burak Bekdil in Defense News. In the past few years, Turkey was at odds with NATO in the case of sharing its defense secrets with Israel, particularly after Ankara agreed to host the alliance's key radar system in Malatya. Despite Turkey's strong opposition, Washington said they will share the defense intelligence with Israel. The capability to produce its own missile defense system seems to be Turkey's only solution in keeping its military secrets out of Israel's hands and the Chinese defense firm is offering this golden opportunity. Oct. 15, 2013 update: Çağdaş Üngör offers some perspective on Erdoğan's SCO gambit at "Turkey and the Shanghai Cooperation Organization: Few Shared Values and No Common Destiny." In January 2013 Prime Minister Recep Tayyip Erdoğan refueled the controversy of Turkey's "axis shift" when he said that Turkey might consider dropping its bid for EU membership if the SCO were to accept it as a full member. Though this took many by surprise, it was not a completely new proposition. Ten years earlier, SCO advocacy was popular among the "Eurasianist" circles in Turkey, which stood at the opposite ideological pole from the ruling Justice and Development Party (AKP). Kemalist Eurasianists were a small but influential group composed of high-ranking generals, left-wing intellectuals, and members of the Labor Party who envisioned a secularist, nationalist path for Turkey with no ties to NATO. Their foreign policy vision couldn't have been more at odds with the AKP, which, when it came to power in 2002, advocated Turkey's full integration into the global economy, EU membership, and close ties with the United States. And unlike the Kemalists, the AKP saw the country's Islamic values and Ottoman heritage as an asset rather than a liability. The decision obviously speaks of the strategic perceptions and geopolitical inclinations of the ruling Justice and Development Party (AKP); but it also, and no less importantly, bears testimony to how much the Turkish military – that could once be safely counted on by the United States to impose the preferences of the Pentagon on the nominal, civilian rulers – have become estranged from the West. In the 1980s, American officials could refer to the Turkish generals as "our boys". Those days are far gone. Fifteen to twenty years ago, the Pentagon's "boys" in Ankara would have advocated for the Patriot missiles. It would have been inconceivable for them to even contemplate preferring a Russian anti-missile system or acquiescing to the purchase of a defense system from China. The close bonds that used to exist between the Turkish high command and the Pentagon have largely been severed during the AKP's decade in power. The fact that the Turkish generals no longer do the bidding of the United States and other Western allies is not unrelated to the widespread perception among the ranks of the military that they have been abandoned, even betrayed by their erstwhile trans-Atlantic friends. While the Turkish missile decision may appear as "treason" in NATO quarters, that can conversely be assumed to be the prevailing feeling among the Turkish officers' corps as well. The court cases that have landed hundreds of serving and retired officers in prison are bound to be seen as having been made possible because they enjoyed the tacit benediction of the United States. However, the estrangement of the Turkish military from the United States predates the "Sledgehammer" and "Ergenekon" trials; it was the American engagement in Iraq from 1990 and onwards that led the Turkish military to conclude that the strategic interests of Turkey and United States no longer converged, in particular as one major consequence of the Iraq wars was that the Kurdish aspirations for independence were stimulated. Oct. 25, 2013 update: For a detailed assessment of the CPMIEC feint, see Nilsu Gören, "Turkey's Air and Missile Defense Acquisition Journey Continues," who, from a Turkish perspective, comes out against the move. U.S. companies now might think twice about selling Turkey fighter aircraft like F-16s or F-35s, or advanced radar systems, because Chinese technology will compromise their systems. It might even be illegal for U.S. corporations to work with Turkish businesses once the deal is complete. All in all, Turkey might be thinking they worked out a great arrangement because it saved money and forged a deal with a growing economic powerhouse. But this will affect U.S. national security almost as much as Turkey's because we too have interests in the region and in the cohesiveness of the NATO alliance. Nov. 21, 2013 update: EurasiaNet.org reviews this topic in "Turkey: Not Making Eyes at the Eurasian Union -- For Now" and concludes that "Few observers believe [Turkey's joining the Shanghai Cooperation Organisation is] likely, but it's not completely out of the question." Western diplomats speaking to Al-Monitor said that as much as there is discomfort about Turkey's decision to choose a Chinese firm, they argue that this decision in no way is going to lead to any marginal decision that would expel Turkey from NATO. "Turkey is a strategically very important country. That thought of expelling Turkey out of NATO is totally out of question," one Western diplomat told Al-Monitor. NATO Secretary General Anders Fogh Rasmussen's statement on Oct. 22 in fact confirms this calm approach. "Our position is very clear. It is a national decision to decide which equipment to purchase. It remains a national decision. However, seen from a NATO perspective, of course, it is of utmost importance that the systems nations plan to acquire can work and operate together with similar systems in other allied nations. That is what we call interoperability," he said. "I feel confident that Turkey is aware of this NATO position. I am also confident that Turkey's authorities will take that into account, before taking the final decision." Putin, replying to a question over Ukraine's abrupt decision to call off an agreement with the European Union, implausibly denied this shift had to do with politics, then added as a jibe: "We will ask Turkey what we can do. Turkey has great experience in EU talks." Erdoğan replied: "You are right. Fifty years of experience is not easy. Allow us into the Shanghai Cooperation Organization and save us from this trouble." Comment: The sarcastic quality of this exchange makes one doubt its seriousness. Still, it does give further insight into the Erdoğan's wanting to be free of Europe. In his trademark aggressive way of sitting, Vladimir Putin (R) hosted Tayyip Recep Erdoğan in Strelna near St. Petersburg on Nov. 22, 2013. Dec. 1, 2013 update: In analysis of Erdoğan's SCO gambit, Aydin Albayrak of Sunday's Zaman concludes that it's just a way to get the European Union's attention. Elaborating on Erdoğan's recent remarks to Putin, a senior official of the ruling Justice and Development Party (AK Party), who spoke on condition of anonymity, has told Sunday's Zaman that Erdoğan is not serious about the SCO. "The real motive is to send a message to the EU," the official said. By this move, Turkey apparently wants to show that it has other options. If the EU is unwilling to admit Turkey as a full member, then Turkey may opt for the SCO and EAEC, both of which are considered rival organizations, particularly to NATO." Apart from the SCO, Turkey's interest in connecting with the countries of the EAEC was first revealed when Kazakh President Nursultan Nazarbayev announced at the Supreme Eurasian Economic Council (EEC) meeting at the end of October that Erdoğan had told him about Turkey's hope for membership of the Eurasian Customs Union. A Turkish official, who asked not to be named, had previously told Sunday's Zaman that Turkey's interest in the EAEC is not about becoming a member of it, but improving the country's relations with the Eurasian market as part of Turkey's multi-dimensional foreign policy. "No membership bid is on the agenda," the official had said, dismissing claims that the move may represent Turkey's quest for an EU substitute. As is clear from these officials' remarks, Turkey tends to see the EAEC not as an alternative to the EU, but complementary to it. Dec. 5, 2013 update: Hürriyet reports that the American firm Merrill Lynch has turned down an opportunity to advise and underwrite a public offering by the Turkish defense contraxtor Aselsan, citing the prospective Chinese missile deal. "If it is possible that you will work with the Chinese company, CPMIEC, we would not work with you," it wrote in a letter to Aselsan. This could be a significant step, Hürriyet observes: "Whether Aselsan will be able to find a reputable advisory firm and underwriter for its planned public offering is now a big question, as most such firms are Western." Dec. 9, 2013 update: According to Serkan Demirtaş writing in Hürriyet Daily News, in the aftermath of its many foreign policy failures, the AKP leadership has turned its attention to the European Union again. Turkey's visible pragmatic return to its European Union agenda following a long-term breeze in ties with Brussels is aiming both to distract attention from poor foreign policy performance in the Middle East and to utilize the soon-to-be-signed visa deal with Brussels as part of the ruling party's pre-election campaign, according to foreign diplomats. Demirtaş points to a number of visits and initiatives to establish this change of direction. He does not mention the SCO but by implication it is being neglected. problems posed to Aselsan by the selection of the Chinese company are also affecting its plans for second public offering of its shares. First, Merrill Lynch said it didn't want to get involved in underwriting it because of the position of the US government. In the tender for underwriting, the first choice was Barclays, followed by Merrill Lynch and then Goldman Sachs. When Barclays' offer was found too expensive, Merrill Lynch was approached. When Merrill Lynch did not accept, Aselsan discussed the issue with Barclays and Goldman Sachs. Both companied raised similar concerns with Merrill Lynch and wanted Aselsan to commit itself not to enter into joint production with the Chinese company. Aselsan couldn't make such a commitment because the government's approval of the Chinese offer included joint production and operations. Aselsan, unable to reach an agreement with three underwriters, unofficially approached Citibank and Credit Suisse only to receive the same rejection. As such, Aselsan's second public offering project seems to have been suspended. According to reports, Aselsan is now looking for a Turkish underwriter, but that seems to be a far-fetched possibility. Mar. 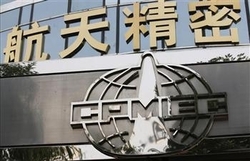 27, 2014 update: CPMIEC has made its first public statement on Turkey's $3.44 billion long-range air and missile defense system, stating of the tender that "It's almost done. We are also approaching the end in the evaluation of Turkey's requests." Sep. 6, 2014 update: CPMIEC's March statement notwithstanding, the deal appears to be falling apart, reports Middle East Forum fellow Burak Bekdil in DefenseNews. He quotes a senior official from the prime minister's office saying that technical negotiations have entered into several problematic areas and so "this option now looks much less attractive than it did last year. We are weighing the merits and demerits of other options," the official said. "There remain scores of unanswered points about the Chinese solution." Bekdil also reports two other important pieces of information about the Turkish government: (1) if contract negotiations with CPMIEC fail, Ankara would re-open negotiations with the European and American bidders and (2) it extended the deadline for all three bidders for the fifth time, now from Aug. 31 to Dec. 31, 2014. Nov. 16, 2014 update: An unnamed analyst in Turkey writes in Al-Monitor about the weapons system decision: "Prime Minister Ahmet Davutoğlu, as the chairman of the Defense Industry Executive Committee, will make a decision on the bidding by Dec. 31. Will Davutoğlu surprise everyone by still preferring China or opt for the French-Italian partnership? Will he listen to his head or his heart? No matter which, there is no doubt that his decision at the end of December will constitute a major clue as to which way Turkey will turn in the coming years." Feb. 19, 2015 update: Dec. 31 came and went, with still no definitive word. But Defense Minister Ismet Yılmaz sounds like the deal is done – and to hell with NATO: "The project will be financed with foreign financing. Work on assessing the bids has been completed and no new official bid was received. The system in question will be integrated with the national system for Turkey's defense and will be used without integrating with NATO." Nov. 18, 2015 update: After 2½ years of playing footsie with the Chinese government and CPMIEC, Ankara has finally canceled the tender provisionally awarded to China to develop a long-range missile defense system worth $3.4-billion. Nov. 24, 2015 update: Today's shoot down of a Russian plane by Turkish forces presumably puts a conclusive end for some time to Ankara's flirtation with the Shanghai Cooperation Organisation. Comment: These two developments in the space of a week point to a hasty Turkish retreat to the bosom of NATO. 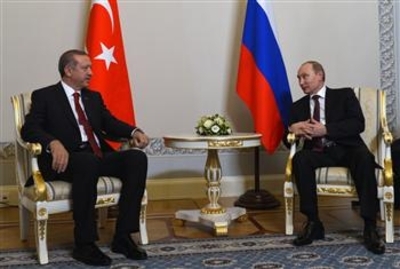 June 27, 2016 update: Erdoğan's abject apology to Putin for the plane shoot-down is accepted and the two governments can resume their efforts to cooperate. Oct. 10, 2016 update: In conversation with Putin, Erdoğan has specifically "invited" a Russian firm to build the same long-range air and anti-missile defense system previously discussed with the Chinese. The Russians had bid back then but the Turks said it was "too expensive." Turkey must feel at ease. It mustn't say 'for me it's the European Union at all costs'. That's my view. Why shouldn't Turkey be in the Shanghai Five? I said this to Mr Putin, to [Kazakh President] Nazarbayev, to those who are in the Shanghai Five now. I hope that if there is a positive development there, I think if Turkey were to join the Shanghai Five, it will enable it to act with much greater ease." Jan. 10, 2017 update: Yekaterina Chulkovskaya takes up anew the topic of Turkey leaving NATO and joining the SCO. In November 2016, President Erdoğan again touched upon the question of Turkey's SCO membership. "[Turkey] shouldn't say, 'I'm for the EU no matter what.' ... For example, why shouldn't Turkey be part of the Shanghai Five [SCO]?" Erdogan told reporters on his return flight from SCO member state Uzbekistan. Unlike his 2013 comment along these lines, this time Erdoğan might this time be serious, and for three reasons. First, Turkey's relations with the West have been seriously damaged since a failed coup in July and the subsequent mass arrests in the country. Second, the EU has become less attractive to Turkey. The EU itself has faced a number of problems, including Britain's departure vote (Brexit), the refugee crisis, the rise of anti-Islamic and anti-immigration sentiments, and the surge of far-right movements. Third, Russia's relations with the West have also been dented by the Ukraine crisis and subsequent economic sanctions, making many observers talk of a new Cold War. As a result, there's now talk of Turkey joining the SCO as a full member. Fyodor Lukyanov, the editor-in-chief of Russia in Global Affairs, says the SCO's importance is rapidly increasing in the world. He believes the main unifying characteristic of the organization is its opposition to intervening in members' internal politics. Many in Turkey believe that this absence of criticism is what Turkish authorities find most attractive about the SCO. Some experts, though, stress the economic benefits for Turkey. 1. Moscow wants to deepen its relations with Ankara and, more than that, expects Turkey's SCO membership to provide additional leverage over the country's policies. Since the July coup attempt in Turkey, Russian experts have started to talk more often about a shift in Ankara's foreign policy from the West to the East. Turkish foreign policy has become one of the most discussed political topics on Russian state-run TV channels. 2. Turkey is an important energy hub, connecting Eurasia with Europe. SCO countries could deepen Turkey's economic ties and help improve energy cooperation. 3. More close cooperation with Turkey in the security sphere is beneficial to Russia. Both Moscow and Ankara face similar security threats in the region, such as terrorism and Islamist extremism. 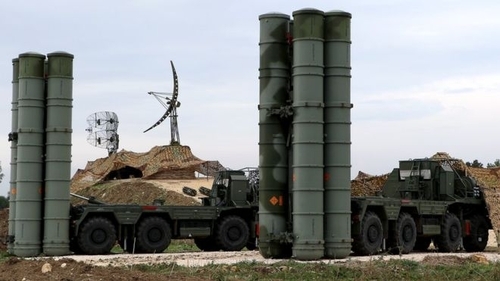 June 3, 2017 update: After giving up on a Chinese missile system, Ankara turned to Russia in 2016 and opened negotiations to purchase its S-400 Triumf, called the SA-21 Growler by NATO. In March 2017, Sergey Chemezov, the CEO of Rostec Corporation, announced that Ankara had agreed to buy the S-400 with a Russian loan. On April 28, Mevlut Cavusoglu, the Turkish foreign minister announced an agreement on the purchase, with negotiations underway on joint production and price. Today, Chemezov said that "all the technical issues have already been agreed on, the current discussions refer to the financial issues [as] the Turkish side is seeking to get loan." Sep. 13, 2017 update: Ankara has put a deposit down toward the $2.5 billion that the S-400 will cost it. Meanwhile, Berlin has cut off weapon sales to Turkey.